Last night I had the yummiest dinner!!! I do not really like the food around here, so this was a yabadabadoo for my taste buds! We took the recipe from the Every Day with Rachel Ray magazine. That thing is full of delicious recipes! In a small pan, heat the EVOO, two turns of the pan, over medium. Melt the butter in the oil. When the butter foams, add the garlic and swirl 1 to 2 minutes. Remove from heat and stir in the parsley.In a hot oven or under the broiler, lightly toast the rolls. Spread with the garlic butter and sprinkle with the cheese. Bake or broil until the cheese melts.In a large skillet, heat the EVOO, two turns of the pan, over medium-high. Add the pancetta and cook, stirring, for 2 minutes. Add the beef and cook, breaking it apart with a wooden spoon, until browned, about 5 minutes. Add the onion, garlic and crushed red pepper and cook, stirring occasionally, 5 minutes. Add the tomato paste and stir 1 minute, then stir in the stock, passata, wine and milk. Reduce the heat to low and stir in the basil. Simmer until the filling thickens and the flavors meld, 15 to 20 minutes.Season the filling, then spoon onto the roll bottoms. Top with the ricotta and roll tops. You can find this and other delicious recipes here. Delicious... I would like to try it!!!! Copiando la receta........jajajaja se ve delicioso! gracias por compartirlo! This look yummy delicious I want it now so hungry great job definitely keeping recipe thanks doll. New post up glasses review. it looks super yummy, I'm drooling right now! Looks so delicious Ileana. Rachel Ray always have very good recipes. Goodness gracious! If I could just take a bit out of this screen. I would be one happy camper! 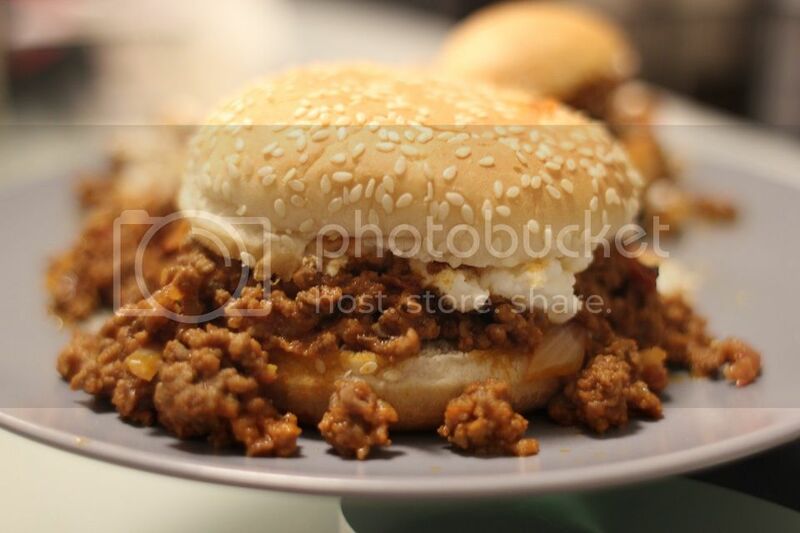 This sloppy joe burger sounds sooo delicious! Must. Try. It. I want eat it Now!!!! Oh God, this looks super yummy. Seriously, I'm drooling! Another really amazing post and I so like the burger, looks yummy. Happy weekend dear! qué buena pinta tiene, seguro que está riquísimo! just by looking at it makes me drool! really! man, i want to make one!